The Bitcoin network is supported by different computers (also known as nodes) that run the Bitcoin software. It’s what creates the decentralization of the system – the fact that thousands of computers around the world own a full copy of the blockchain and are validating every transaction that goes through. The more nodes the system has, the more tamper proof it is. At the moment there are 5655 nodes that support system. In the past I’ve written extensively on how you can help the network by setting up your own node at home, however the process can be a bit scary for newbies or people who don’t have extensive technical knowledge. Today I want to review Bitseed – a product that claims to be a “plug n play” node for the average user. Just plug it into your router at home and you are instantly a part of the Bitcoin network by running your own personal node. Of course you can always use your personal computer for this but then you’d have to give away a large chunk of space from your hard drive in order to download the Blockchain to your machine. With Bitseed things are simpler. The machine comes with the latest Bitcoin version and blockchain already installed (at the time of shipping of course). The developers claim that all that is left is to power it up and hook it to an Internet connection. 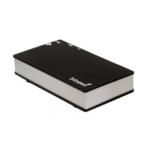 When you order the Bitseed you can choose between a few different hard disk sizes ranging from 480GB up to 2 TB (there is also a lite version that I won’t review here). The size of your hard drive will determine how long your Bitseed can operate as the blockchain increases in about 45 GB each year (in 2016 it increased in 43GB). I ordered my Bitseed about 2 months ago when there was also a 320GB version available. Delivery of the Bitseed was pretty straight forward, however for some reason it’s not shipped with international tracking due to cost issues. Personally I wouldn’t mind spending a few more bucks in order to know where my package is every step of the way. After you order your product it can take 2-3 days until it is shipped. That’s because at the moment every Bitseed is made to order, so someone is actually installing the latest Bitcoin version and blockchain on your machine. It took one whole month for the package to arrive at my house but that’s partially thanks to my country’s postal system that’s pretty crappy. Once it arrive I could barely wait to get it up and running. For basic use all you need to do is connect the Bitseed to your router using an ethernet cable and power it up. Once powered, the device will automatically start within 2 hours. Bitcoin will catch up with the current block height and then run continuously, hosting a full bitcoin node. This much any user can handle, however I wanted to make sure my Bitseed actually works. So after completing the instructions I tried accessing my device. To access your device you’ll need to find its IP address in your home network. If this sounds like gibberish then we’re in the same boat. After some research I found out that every device connected to my router (e.g. my computer, Bitseed, my iPhone etc.) has an address in the form of numbers. For example, in the picture below you can see a computer, an iPad and a printer (HPC5….) connected to the router but no Bitseed. BTW – In order to get to this screen I had to log into my router, I used this tutorial to understand how to do it. I spent the next 4 hours with techy friends trying to debug this remotely but nothing seemed to work. I’ve sent Bitseed’s developers a support request however they said that on first appearance it seems that the disk drive was not found, which means something got damaged in shipment. Finally I decided to hand over the machine to one of my friends at the Bitcoin embassy to take a look at it himself. After a few days he told me he managed to get it up and running without doing anything special. 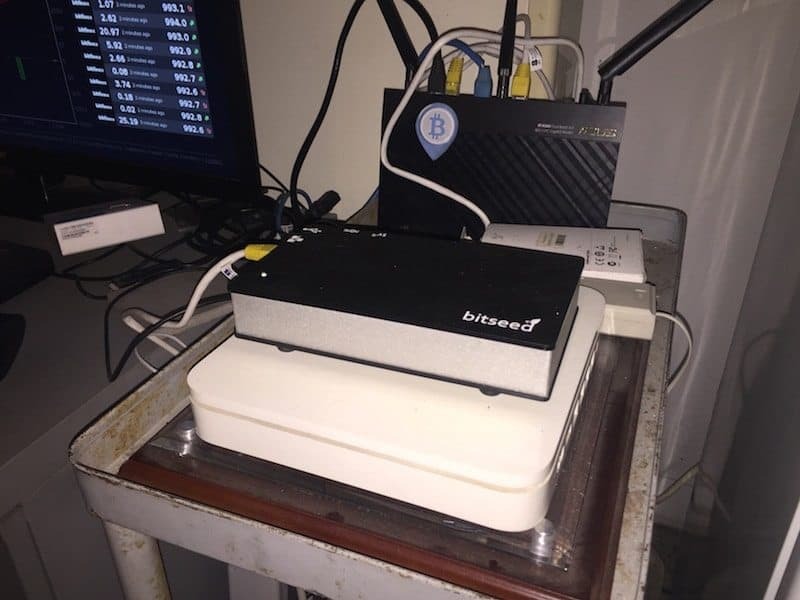 The result is that after 2 weeks of hard work for no apparent reason the Bitseed was up and running in the Bitcoin embassy in Tel Aviv and a new node was supporting the Bitcoin network. Once it was working I could access my Bitseed control panel by entering the device’s local IP address into my browser (the exact same address I was trying to find before). as you can see my device has about 52GB of free space which means it will probably last through the rest of 2017. 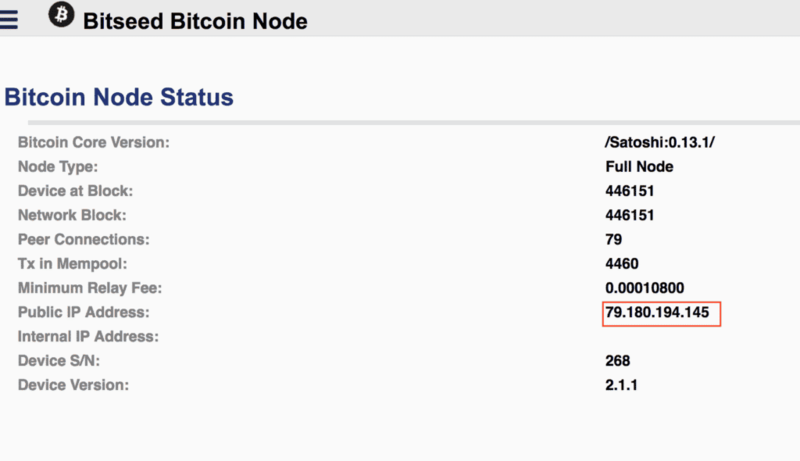 In order to check that my Bitseed is actually part of the Bitcoin network I can check the node status via the home page of the control panel. So my Bitseed is running the latest Bitcoin Core version (which includes Segwit) and my public IP address is also listed on this page. There device currently has 79 connections to other nodes in the network. In order to verify that my bitseed is currently accepting incoming connections from other nodes I can also use the tool supplied by 21.co at the bottom part of this page. All I need to do is enter my public IP address and hit “Check node”. Keep in mind that the Bitseed will shut down for 30 minutes once a week during the time it’s backing up the blockchain, If you try to reach the node on that specific time you won’t be successful. The idea of a plug n play Bitcoin node is awesome and I think we need something like this in the community. However the implementation of Bitseed if far from perfect. The device didn’t work “as advertised”, support was laggy and just stopped responding at one point. If I wasn’t so persistent in getting this machine to work I would have probably given up after one or two hours. It feels as if this is a side project for the founders of Bitseed and therefor you can’t expect to be fully supported even once you become a paying customer. I’m sorry to say that at its current state Bitseed isn’t a good buy, it has more chance of disappointing the buyer than making him satisfied. Of course this is my own personal opinion after experiencing what I’ve described above, your luck may be different. Are you kidding me?? IP address and home network are gibberish for you…? How are you writing for a tech site? Frustrating reading through that.. Hope you’ve studied up since writing this. I assume the issue was you just not understanding how to make sure the miner was on your own network? I was looking for exactly this kind of simple full node set-up. Interesting that it was not as easy as advertised. Anyway I have come to be a strong believer in BTC (Core) and will try my luck, confident I will manage to set this up. Does this support Bitcoin Unlimited? I wonder what does this bitseed do aside from running as support to bitcoin network. What good does it bring to a total newbie like me? Does it mine bitcoin? Im sorry if my question appears stupid but that’s who I am. I am ignorant to bitcoin. Although im planning to engage in mining but I still dont have enough knowledge about it.